Bring your favorite textile bag – quilted, woven, embroidered, felted, or hand me down – and well light it up with LEDs using the latest advancements in electronic textiles. Using conductive yarns we’ll stitch a circuit together; no soldering, wires, or engineering degrees required. It’s even washable. You’ll get an introduction into this fascinating world of interactive garments and how to wade through the mountain of web information to find the supplies you’ll need. Now that these new machines have gone mainstream, it is time to push their boundaries. Bring your embellisher needle-felting machine and discover the many new possibilities that arise when wool meets fabric with the help of five fast needles and a little water. Using simple techniques, you can add punch to your art quilts, make fabulous clothing and accessories, or create fantastic wall pieces all with textured surfaces perfect for embellishment with embroidery or beads. Fabulous textures can be created by laminating wool fibers to cloth in a process known as Nuno felting. In this class, you’ll weave your own cloth to be laminated to wool fibers. We will begin by weaving a loose web of cloth, take it off the loom, add luxurious merino wool fibers then wet felt everything together. You’ll create new textures that no other technique matches. This is a great way to use up your collection of white yarns, or a mixed warp of everything and the kitchen sink. But don’t worry if you aren’t a weaver, this simple structure is easy to get on the loom. Forget everything you’ve heard about hours of rolling, and don’t worry if you’ve never felted before, results are guaranteed. You’ll go home with a wonderful scarf, plus the inspiration and knowledge for what comes next. Beginners to advanced in either technique will love this combination. Weekend class finishes a scarf. Longer class uses a little loom magic to create a completely different look from the same warp. Advanced weavers may try different weave structures. Everyone Needs a Housewife; that person who does chores, cooks meals, does the wash. We can’t make a robot, but we will make the next best thing: a portable sewing kit updated from the 18th and 19th century “housewives” both men and women carried. We’ll make a wet felted base complete with pockets, and self-tie. While working we’ll share stories from our days in home economics or robotics depending on your generation. When you get home you can further customize if for your favorite sewing tools. Create unusual designs by cutting printed fabric and reweaving it in the same order as cut. Sometimes called “California Rags” or “Picture Rags”, the compacted design still holds the original pattern but distorts and textures it to create a whole new fabric that coordinates with the original fabric for unique special effects. Learn what types of fabric work best, the weave structure best suited for the process, and how to choose colors to enhance the new fabric. Then learn a simple finishing technique using the original fabric. Play with beautiful colors of luxurious merino wool, silk, beads, and embroidery yarns. We’ll use wet felt making techniques to create a “dancing lady,” a purse, vessel, and flowers. Discover how adding cloth to the wet-felt process creates the standout textures of nuno felting, and learn a bit about 3-D felt making. Embellish pieces with beads and stitching to enhance your unique designs. Use the differential shrinkage properties of wool and silk to create a uniquely textured textile the perfect weight for a handbag. We will cover patterned silk cloth with wool roving and laminate the wool to the silk. We will make a simple coordinating handle, learn a quick trick to reign in the resulting ruffles, and discuss how to stitch the whole thing together once the fabric dries. You’ll enjoy carrying the most unique bag around. Shorter scarves and collars are the perfect thing at home on cold winter evenings, to upcycle an old shirt, or when you don’t want the bulk of a full size scarf. Loop scarves offer endless draping options. The addition of soft silk chiffon in the nuno felt process adds just that much more luxury. In this class we’ll look many ways merino fibers can gather the chiffon for a custom fit, then make your choice of style. Imagine all those beautiful nuno felt textures gracing your dinner table. Plus a decorative nuno felt table runner is a great way to use up all those silk scarves, lightweight handkerchiefs and skirts, and bits of handspun from your stash. Choose your colors for holiday use (watch out Martha Stewart!) or just go wild with color and texture. We’ll create a nuno felt collage fabric perfect for your table. There are many ways to make bags, so I offer two different nuno felt resist options. In this class we’ll make a classic bag shape with fold over flap. You’ll laminate cloth to one side of the wool for a self-lined bag and create your own unique design on the outside. You will learn how to work with resists, a great start on 3D felting. The translucent light weight chiffon that is so easy to laminate to wool in the nuno felt process makes the perfect window accent. You can create a window panel or long valance. You’ll have your choice of curves and ruffles or more formal clean-cut options. Think whimsical windows. Think texture, think shape, think color. Think scarves, pillows, pocketbooks and garments. Think your wildest dreams; just donÕt think inside the box. 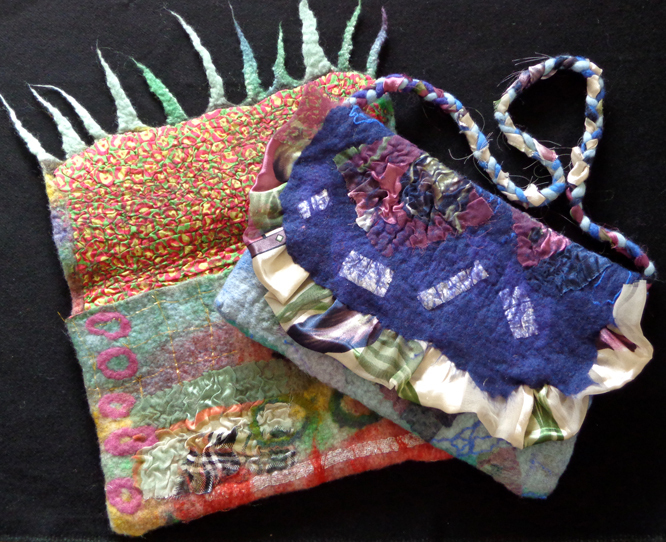 We will laminate wool fiber to all textures and weights of silk and cotton cloth in this wet felting class and send you home with finished pieces and samples for future projects. An embellisher machine will be available for you to try. This is a weekend long class. Nuno Felting is the process of laminating wool to selected areas of a base cloth. In this beginner class we’ll master the process by making several small humanoids, animals, and ornaments. These smaller projects are a fun introduction to the process and give you the skills needed to make larger projects successfully. Merino fleece, base cloths, and decorative items will be provided. 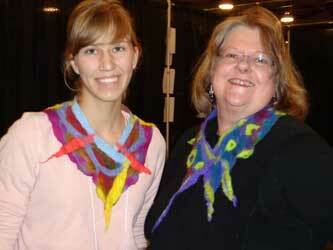 In this class you will make a lightweight drapeable wool and silk scarf. We will discuss appropriate materials and see samples of finished pieces. You will go home inspired by the limitless possibilities of this exciting process and what you can do next. Marino fleece, fabrics, and decorative items will be provided. Students are asked to bring a roll of bubble wrap 12 inches x 2 yards min., (make sure only one side is smooth), small amounts of fibers or yarns you’d like to try (optional), and rubber gloves. Now that you know the basics of nuno felting, you can push the boundaries to make wild and funky textured scarves. Some of the new techniques we will try are: adding fringes, making puckered and sheered textures, shaping the fabric by changing the direction of the fibers, and alternating the side of the fabric that has added fibers. Marino fleece, fabrics and decorative items will be provided. Students are asked to bring a roll of bubble wrap 12 inches x 2 yards min., (make sure only one side is smooth), small amounts of fibers or yarns you’d like to try (optional), and rubber gloves. Creating a seamless garment is a week long class. This advanced nuno felt class is an introduction to garment making. You will make a sample seam, learn alternate ways to lay out fibers and begin the initial shrinkage, and construct a pattern for a full sized vest to make after class. Felted beads can be a colorful and unique addition to any wardrobe, be used as buttons, or just sit in a bowl and look beautiful. 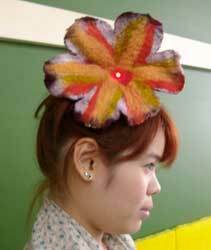 In this class, we’ll make wet felted beads of several sizes and shapes and in many colors. We’ll embellish them with beads, yarns, and even tie-dye them. This is a fun and creative class. Using silk and cotton fabrics with cold water dyes, we will create bold designs that are perfect for enhancing nuno felt base cloth. These are quick and fun techniques that make textiles that can stand alone as beautiful pieces or be used as a base for laminated felt. Be careful: these techniques are addictive, you can’t do just one. 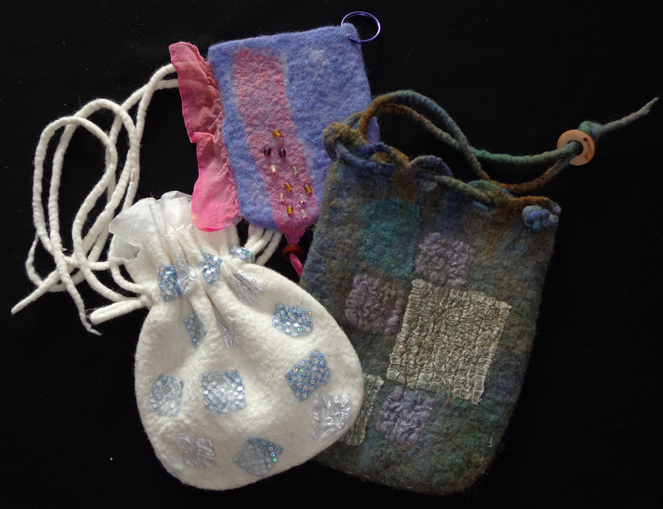 Using the cloth dyed during the previous class we will delve into the exciting craft of nuno felting. This wet felting process offers an endless number of possibilities to create new textures and shapes by varying the base cloths and the manner in which the fibers are arranged. Once felted, the fleece acts like a color wash that adds depth to the finished look. We will use different fleeces, pre felts, rolags and try an embellisher machine to create exciting new textures that cry out for further embellishment. 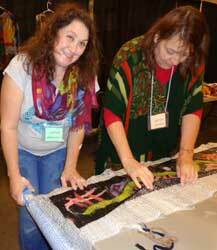 Weaving classes available for guilds and conferences. Take a second look at plain weave and you’ll find it’s not so plain after all. Utilizing color and weave effects, differential shrinkage, novelty yarns, spaced warps, and a few other creative surprises, you’ll find there are a myriad of possibilities for this simple weave structure. Working as a round robin class with pre warped looms, you’ll go home with a sampler of possibilities for full sized projects. If you can cut it with scissors, you can weave it. Coke bottles both plastic and aluminum, used tea bags, q-tips, parchment paper, coffee bags, all your old clothing: this class invented “think outside the box”. Join me for a fun time keeping things out of the global scrap heap a while longer. There are many wonderful off loom projects that use small amounts of yarns. 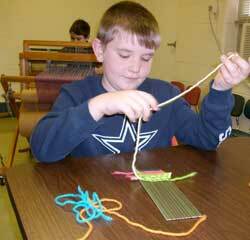 We’ll begin by constructing a simple loom from inexpensive materials. While you’re weaving, we’ll look at a number of other simple looms and small projects. These projects are also suitable for use with children. We’ll discuss what ages are appropriate and a few hints on working in groups. All supplies, handouts, and materials for making the other sample looms you didn’t get time for in the class are provided. Geri Forkner has been referred to as a folk artist. In 2005 she began a journey that started on a whim and has continued until this day. Because she has long been interested in repurposing things nobody wanted but were too good to throw away, she decided to make a small weaving of things that came into her life that day, every day for one week. Then maybe continue for one month, before long there were 365 small weavings. With no overall plan, the pieces, when viewed as a whole, didn’t seem to hold together as an “art work”. There was no intentional line to follow, no triangular forms for the eye to find, no color to walk the observer’s eye through the piece. Art 101 it was not. But the final piece held together with the rhythm of its 3” squares. The biggest surprise for Geri came when she exhibited the third year of her ongoing project. People were drawn into the strips finding everyday things they could relate to. Join Geri for the “Daily Weaving” story to find out her motivations, spin off projects, and an insight into her latest effort to deal with a lifetime’s accumulation of making one of everything. Geri Forkner is a multi media fiber artist based in East Tennessee. As well as constantly honing her skills as a weaver and felter, she has spent many years exploring ways to save materials from the global scrapheap. 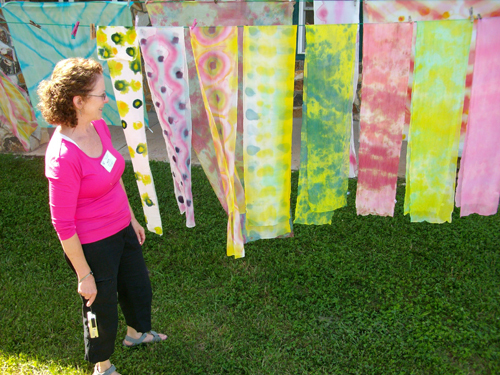 She enjoys using the traditional fiber processes in unique ways to express ideas about life. Her newest passion is the new world of wearable technology. In this presentation Geri will take you on a tour of East Tennessee, South East Asian countries she has visited, art work inspired by these locations, and just enough e-textiles to raise your curiosity. In November, 2015, Geri Forkner went on a 2 week journey to Peru that focused on the weaving villages in the Peruvian highlands. Along with visiting 5 weaving communities and interacting with all the weavers, she also visited some of the greatest archaeological sites of the Incan Empire. The tour benefited the weaving communities affiliated with the Center for Traditional Textiles of Cusco begun by Nilda Challanaupa 20 years ago. Her goal was to revitalize the traditional techniques and materials of weaving that dated back to pre-Columbian times. This slide presentation will take viewers to the five weaving villages and give an insight into ancient Incan culture that is behind the traditional weaving. Textiles representative of the techniques, yarns dyed with local natural dyes, and tools will be available to view first hand. Geri Forkner has traveled to countries in South East Asia, Mexico, Guatemala, Peru, Uzbekistan, and Hungary in search of traditional fiber processes. Forgo jet lag and join her on a whirlwind tour to see traditional weaving, spinning and dyeing along with the countryside that influences the artists. Textiles from each country will be available to view first hand. 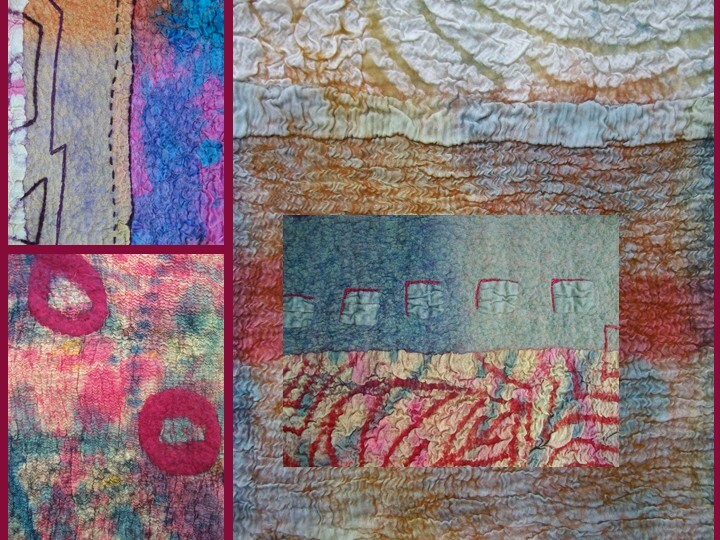 Learning about fiber art is a perfect way to take a cultural trip around the world. Looms ranging from the simplest pile of sticks to the most modern computer assisted machines are all in use today. Starting right here in Appalachia and continuing around the globe the history, future, and culture of weaving has enough stories to fascinate everyone. There are endless curriculum tie-ins to social studies, math, science, and art. 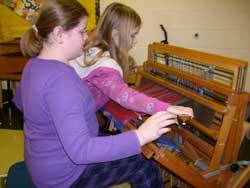 Students will learn about how their clothes are made by spinning, dying, and weaving yarns; create a group project on a floor loom utilizing items brought in from home; weave an individual off loom project and write a story about it. Students will understand how clothes are made by spinning, weaving, and dyeing yarns; compare and contrast different fibers; try on clothes from other countries; participate in group activities related to the fiber arts; and write stories about their projects. 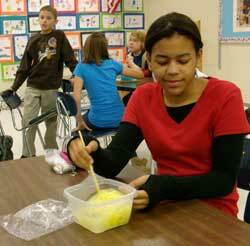 Students will learn that clothes are made in many different countries from different fibers. They will understand the dyeing, weaving, and spinning processes. They will learn hand-weaving skills, appreciate the clothing and customs of different cultures, and learn how to write a color story. 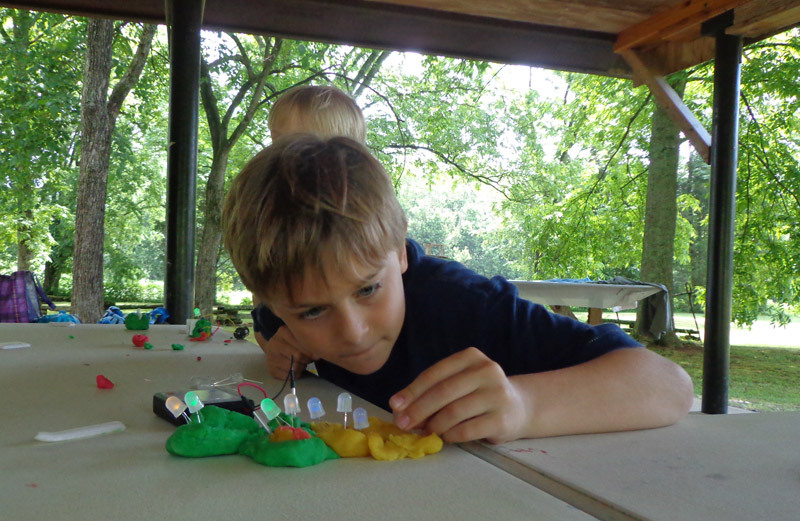 Using easy to come by supplies, such as salt clay and aluminum foil, we will construct LED circuits cleverly disguised as craft projects. The vast and complicated world of electronics will be simplified with Internet resources in plain English. There are no engineering or soldering skills required for the workshop; however, for those of you with programming skills, the new world of electronic textiles will amaze you with its possibilities. Appropriate for First through High School. Teach simple electrical circuits to children as young as first grade. Use conductive and non-conductive clays in combination to light up LEDs. You can teach sculpture and electricity all at the same time. Perfect for STEAM education. In this hands-on class we’ll make action sculptures using inexpensive and accessible materials then light them up with LEDs. No soldering needed. We’ll learn a simple electrical circuit easy enough for all levels of students. Add electricity to art and craft paper projects you are already doing in your classroom. Using copper foil tape, create a simple electrical circuit to light up a greeting card or picture with LEDs. No soldering or engineering experience required. If you are more interested in clothing than robots, this STEAM class will introduce you to the new world of electronic textiles. 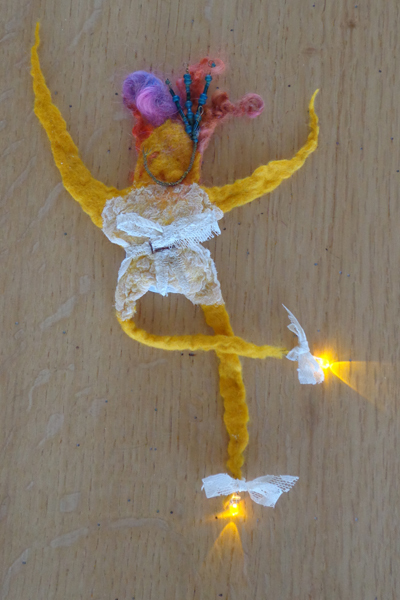 In this hands-on class, you will stitch an LED into a textile using conductive thread. You will be introduced to what’s possible in this rapidly expanding industry and learn a basic electric circuit all without needing an engineering degree. However, you might inspire some students in that direction. Interested in programming? We will also discuss what is possible with arduino, lily pad, and raspberry pi and see working examples. Natural dyes have been used for centuries in every culture and on every continent. The colors range from bright to subtle and can last for hundreds of years when applied properly. In this workshop you will learn how to dye wool yarns beautiful colors using natural and chemical dyes that are foods and food safe. These are hands on projects that work in the classroom for all grade levels using a minimum of readily available inexpensive equipment. There will be plenty of curriculum tie-ins and maybe a snack or two as well. Weavings made on simple hand held looms are the starting point for story telling in this hands on workshop. We’ll tell a color story then weave and write our own individual stories. In the process we will learn about traditional story cloths from cultures around the world, learn several weave structures, discuss alternate age appropriate weaving projects, and be amazed by some little known historical facts that will work as curriculum tie ins for multiple disciplines. Using easy to come by supplies, such as salt clay and aluminum foil, we will craft LED circuits cleverly disguised as craft projects. The vast and complicated world of electronics will be simplified with Internet resources in plain English. There are no engineering or soldering skills required for the workshop; however, for those of you with programming skills, the new world of electronic textiles will amaze you with its possibilities. Appropriate for First through High School. How many LEDs will one battery light? Speaking and Listening: Integrate and evaluate information presented in diverse media and formats, including visually, quantitatively, and orally. Standard 1.0 Media, Techniques, and Processes Students will understand and apply media, techniques, and processes. For centuries families and communities gathered together to make their clothing and household linens by preparing fibers, spinning and dyeing yarns, and weaving or knitting fabrics. Today, the process of making clothing is fragmented – fibers may be grown in India, spun in Guatemala, dyed in the United States and assembled in Vietnam. In the process, we have lost not only the ability to make our own clothing, but also the cultural integrity that goes along with producing a unique, identifying garment from beginning to end. Teaching fiber arts raises an awareness of the issues of globalization, restores an element of cultural pride, and begins a conversation about local- and self-sufficiency. Community-wide, site specific, fiber arts projects have far reaching impacts both on the students that participate and the community that is the recipient.